My father has many gifts but dancing is not one of them. My mother taught me to dance: the two step, the waltz, the cha cha cha. She played the jazz tunes of Glenn Miller and Benny Goodman. We danced in the living room. She wore house slippers; I was in bare feet. She led, of course. She dipped me, twirled me, spun me on the toes of my feet. I have loved dancing ever since. I remember the nub of the carpet under my feet. Sunlight filtered through heavy curtains. The music came out of the stereo. It was the size and shape of a sideboard. One side was for storing the albums and the other for the record player. We children were not allowed to touch. 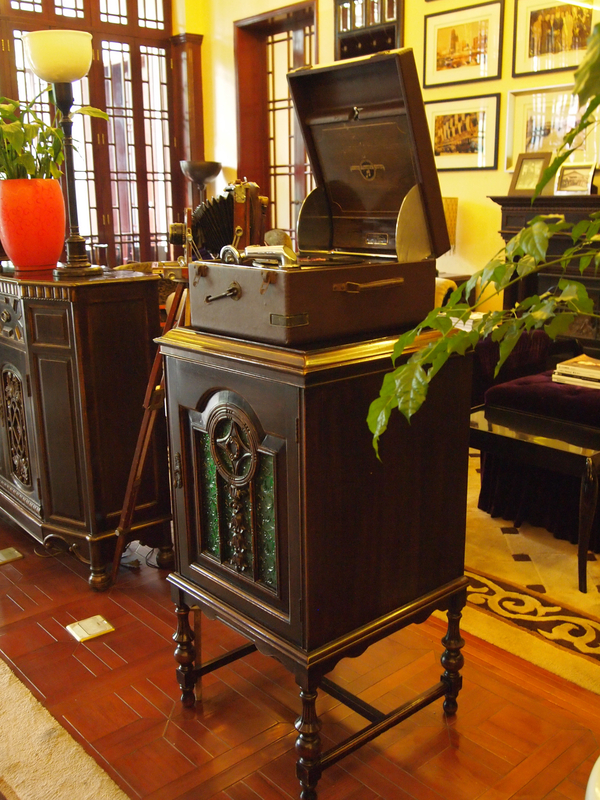 a floor model Victrola with a picture of the dog and the words ‘The Masters Voice’ printed on the inside of the lid. Grandpa brought […] albums of all the famous symphonies and some operas (Madame Butterfly, e.g.). But I don’t remember ever finding Grandpa listening to any of those records. As a matter of fact, I don’t remember finding anyone else listening to them besides me. Dad’s love of music led him down strange paths. He once told me that he had become Presbyterian because they had the best choir in Shanghai. But he credits his musical education to others. On our block [at Avenue Haig] was a German compound including their consultate, a school and one of the most powerful radio stations in the Far East. I’m not sure what all the secret things [were that] they conducted in the compound but that radio station broadcast among other things classical music almost 24 hours a day. Actually, it was much more than just playing music. They did it like teaching Music 101 with all kinds of information on the composers, the work and the performers. A British army camp resided on the other side of the house at Avenue Haig. They, too, played music though of a more martial nature and only during band practice on Wednesday afternoons. I used to wonder if those foreign solders go to war with or without the music on or what was the music for? Dad must have figured it out. On Sunday mornings, he used to blast John Philip Sousa from the stereo to chase us all out of bed. Jazz is the rhythm that drives my novel, The Dancing Girl and the Turtle. Song Anyi is the dancing girl in the title. She works at the Metropole Gardens where men can buy tickets to dance with her. Andrew David Field has meticulously researched Shanghai’s Dancing World: Cabaret Culture and Urban Politics 1919-1954. He tells us that, during the depression in the 1930s, the price of a dance ticket fell to a few dollars. But even in the worst of times, a particularly popular hostess could command the highest rates. In my novel, Song Cho is a turtle. He’s also Anyi’s cousin and her lover. In Shanghai’s dancing world, a dance hostess was called a locomotive (longtou) and her faithful patrons, the cabooses (tuoche). There were other colorful phrases, too. Not all of these encounters ended well. Some women were jilted, impregnated, abandoned. One dancer, after unsuccessfully trying to blackmail her former lover, was kidnapped, bound and thrown into Soochow Creek. Other dancers took their own lives. It was a great nuisance for the owners and operators of dance halls. In this scene from my novel, the Metropole Gardens has just opened. The Cantonese dance hall owner Mr. Yip and Manager Lin appraise the action on the dance floor. ‘Do you make enough money from the young ones?’ Yip asked. 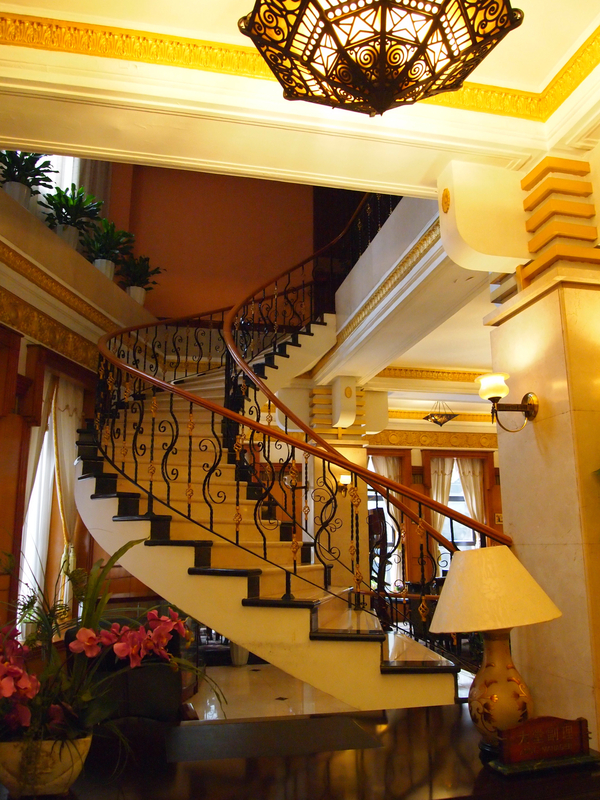 The Metropole Gardens where Anyi danced really existed. As did the other jazz clubs, casinos, hotels and dance halls I’ve named in my novel. Some dance halls sinified the jazz to make it easier on Chinese ears. But there were also big names from America and Europe who came through Shanghai during its heyday. Listen to them play. Imagine Duke Ellington and his Orchestra playing It Don’t Mean a Thing (If It Ain’t Got that Swing). Or my mom and me, two-stepping across the living room floor.